If you plan a pond, plant waterlilies and other floating plants to cover the water surface and prevent evaporation. Be sure and put in some mosquito fish to keep your pond free of mosquitos. A pond should have some connection to ground level so that frogs can come and go. Believe me, frogs can be stupid and they won't walk the plank. If you have very sandy soil, a drip system may not be the best solution because the water will not spread around the root ball but drains away quickly instead. In this case you will have to continue with overhead watering or hand watering the individual plants if you have the time and inclination. Drip systems work well with normal or clay soils. Many native and drought tolerant plants do not like to have warm wet roots in summertime. Water early in the morning, but try not to water at all during heatwaves unless unusually prolonged. If a heatwave is forecast, water the day before so that your plants can take up the water and protect themselves. Note that all plants, drought tolerant or native species or not, need water when they are fresh in the ground, and for the first couple of years until a good root system is established. A new garden should be planted in late fall or early winter to take advantage of winter rains to get the roots down. The plants will be healthier and will need less water in the spring and summer. If you plan to install a birdbath, be sure that you can refill it easily as water evaporates quickly in hot weather. The Los Angeles Department of Water and Power will pay cash rebates to its customers to encourage the removal of 250 to 2,000 square feet of wasteful lawn and replace it with drought tolerant plantings, or even mulch. Be aware that if you include the parkway in your plan, that the City of LA will require a permit which costs $500! There is a permit waiver program which requires you to plant specific plants in the parkway, not the greatest selection alas. The cities of Corona and Long Beach also offers financial incentives for lawn removal. Find out if your city or local water provider is offering this type of rebate because it is available in several counties in California. Arizona, Nevada, and Texas have similar programs in place or in development. $$$. Water rates are going up fast and most homeowners use a lot more water in their gardens than they do inside their homes. Take a look at www.bewaterwise.com to find tips on how to save water at home and in the garden. Weekly lawn maintenance and bedding plant replacement are costly, whereas waterwise gardens require much less frequent maintenance. Have you looked at your water bill lately? Ouch. Our water providers are raising rates quickly to deter us from using excessive amounts of water during shortages. At last, the city of Los Angeles is enacting new environmental rules for landscaping. One aspect of these new rules deals with run-off. Previously homeowners were required to eliminate rainwater via gutters, downspouts, and drains to the street, where it would flow into storm drains and down to the ocean. Run-off carries vast quantities of dog faeces and street pollutants to our beaches and marine habitats. The new rules require that water is retained on the property where possible and allowed to percolate through the soil and into our aquifers. Dry wells (large perforated tanks buried in the soil can be installed for this purpose. However, if the soil is sandy a low berm will be sufficient to hold the water while it sinks into the ground. You can also dig a pit in sandy soil and fill it with broken concrete, gravel, etc. Direct water from the downspouts to this area and the water will percolate down. The pit can be covered with pebbles for appearance. California, although often dry, sometimes is blessed with plentiful rainfall and before the land was paved over much of this rainfall was absorbed through the soil and into the aquifers. With paving came run-off and drains, directing the water to the sea. Now we have diminished aquifers and a huge thirst. The above drawing shows how you can help augment our water supply. One way to deal with water that drains from roof is to build a seasonal creek using gravel and rock. It is important that the level of the seasonal creek is below the foundation of the house, see drawing. Allow the water to exit the downspout into a drain in the usual way. Dig out the location of the seasonal creek , which can meander around until it reaches the street, or preferably stop in a low point in the garden. The banks of the streambed should be stabilized by rock or broken concrete. Line the bottom with four inches of coarse gravel or pebbles so that the water can flow cleanly. Planting the edge of the streambed with grasses and other plants will enhance the natural appearance. In summertime or when the streambed is dry the it should be cleaned of leaves and debris to maintain an attractive appearance year-round. 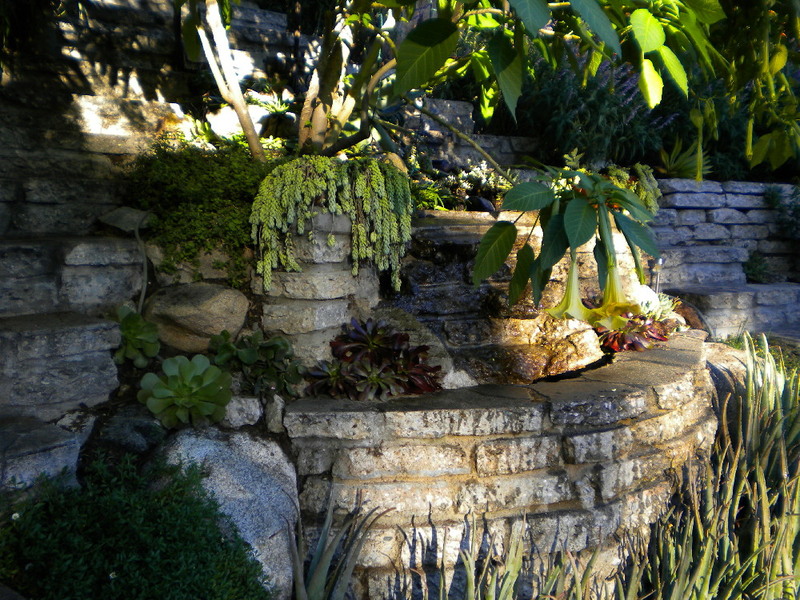 If the stream ends at a low spot in the garden, the end point might be widened to emulate a small pond and a large boulder or two can be embedded in the gravel bottom. 1. Fewer demands on our aquifers and rivers, allowing fish populations to recover. 2. Less run-off which carries dog poop and engine oil etc. into the storm drains and down to the ocean. 3. When we reduce irrigation, we are not adding so much cloramine (a water purification chemical that has replaced clorine) to the soil. Cloramine, unlike clorine, does not break down quickly and resides in the soil as ammonia where it may harm the microorganisms that are essential to soil health. Cloramine kills fish. 4. Reduced irrigation prevents unhealthy molds and fungi such as oak root rot (which does affect other trees and shrubs) from developing in our gardens. Many native and drought tolerant plants do not like to have warm wet roots in summertime. Water early in the morning, but try not to water during heatwaves unless unusually prolonged. If you have very sandy soil a drip system may not be the best solution as the water does not spread, but drains away quickly. In this case you will have to continue with overhead watering or hand watering the individual plants if you have the time and inclination. If you plan a pond, plant waterlilies and other floating plants to cover the water surface and prevent evaporation.